Happy belated Halloween, #GenXYZ! We are very excited to make two HUGE announcements. Hold on tight. First, .xyz Founder Daniel Negari has acquired a new 13,000 square-foot office building in Las Vegas, Nevada, that will serve as our new headquarters. The building, which will be called the XYZHAUS, will employ approximately 100 people to perform marketing, support, legal, and other services for .xyz and .College with the goal of bringing choice, affordability, and innovation to the internet. Check out the exclusive look on Morgan Linton’s blog, Elliot Silver’s writeup on his new site, DomainInvesting.com, and our article in the Las Vegas Sun. We’re also very happy to announce that .xyz is now officially in Africa! You heard right; Team XYZ has been working diligently with Web4Africa to become the first new domain extension to be carried by the African registrar. You can now visit our new .xyz landing page directly from their homepage, or check out our awesome placement on their domain name page. We’re thrilled to be the first domain extension to have the kind of presence that we do on Web4Africa’s site, and even happier to be partnering with them to bring greater awareness and access to the world. Be sure to check out HumanIPO’s article on the partnership and the original press release here. 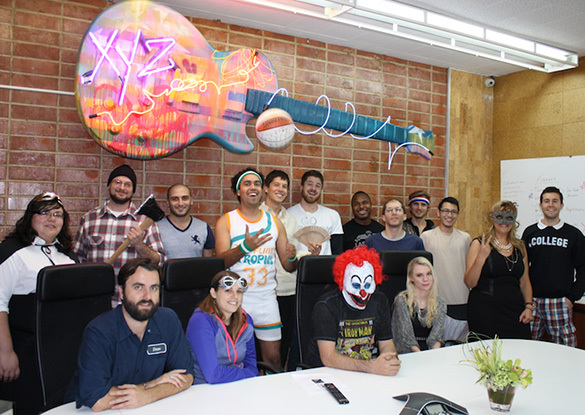 And as a bonus, we wanted to share a .xyz family photo in the spirit of Halloween. Be sure to check out our other photos at GenXYZ.com, and follow us on Facebook, Twitter, and Instagram to get all our other fun updates. We’ve got a juicy new video interview for you to check out on TheDomains starring ICANN’s poster boy, .xyz Founder Daniel Negari. As part of their new global awareness campaign, Daniel was the first operator featured in ICANN’s interview series to “provide insight into the individual story of a TLD, or portfolio of TLDs, the inspiration behind it and how they see it being used.” Domain Name Wire also has an article explaining ICANN’s new video project, make sure you check it out! We know a lot of you out there are curious about Team XYZ. Thanks to Morgan Linton, you can now take a peek into our LA offices and get a taste of our day-to-day. Check out Morgan’s tour of our office and thoughts on the team. Thanks for stopping by, Morgan! Make sure you also check out our new landing page on 101domain. We’re thrilled that so many of our registrar partners are sharing .xyz with the world. Don’t forget to pre-register your .xyz domain today. Before we go, we wanted to let you know that the XYZ Store is almost sold out! Make sure you grab one of these first run t-shirts before they’re all gone. Our team of designers is hard at work on some new products, so stay tuned for the next round of merch. Let us know what you think of the .xyz crib on Facebook, Twitter and Instagram, and don’t forget to tag us with #GenXYZ. Greetings, #GenXYZ! With all the new side projects we’ve got in the works, we thought it was high-time for an update. First off, we’re pleased to announce the new GenXYZ.com, created specifically for you. Now you can peruse XYZ.COM for our blog, information and media pages AND GenXYZ.com for fun social stuff. Speaking of stuff, remember those awesome t-shirts we mentioned in our last blog? Ask and you shall receive. Our brand new store is open and ready for business. Head on over to XYZ.COM/store to purchase your very own .xyz or .College merch. If you’re on the look-out for some free swag, keep an eye on Elliot’s Blog for our upcoming contest. Some very lucky #GenXYZers will be taking home .xyz t-shirts of their choice. We’re also psyched that .xyz is still dominating the headlines. Our backend registry partner CentralNic had nothing but glowing remarks for .xyz in their latest interview with Directors Talk. In fact, CentralNic CEO Ben Crawford even refers to us as the next .com. That’s high praise. Check out the Q&A here. But that’s not all! Some new press with our Founder and fearless leader Daniel Negari are scheduled to be released in the next few days, including a juicy video interview on DomainSherpa. Stay tuned for more updates. That’s it for now, folks. Once you’re done checking out the latest and greatest in .xyz news, drop us a line on Facebook, Twitter, or Instagram and let us know what you think! Good morning, #GenXYZ. As you might have guessed, we have some exciting news to share. As you know, .xyz is an international domain extension. #GenXYZ itself encompasses all different countries and cultures! That’s why we’re translating our website into different languages, to make sure we include everyone in the XYZ movement. With that in mind, we’d like to say a hearty Guten Tag to our German readers across the pond! That’s right, XYZ.COM is now available in German. Visit XYZ.COM/de or click DE on the top right corner of the homepage for a full translation of the site. Serh erfreut, Germany. Tell your friends! Happy hump day, #GenXYZ. We’re happy to announce that XYZ Founder Daniel Negari and leading domain auction company NameJet have just struck a deal to bring .xyz to the masses. So what does this mean exactly? NameJet.com will be auctioning .xyz domain names in early 2014 during our Sunrise and Landrush phases. For more about .xyz’s 2014 release, check out our Timeline on the XYZ.COM website. Make sure you sign up for our newsletters and follow us on Facebook, Twitter and Instagram to find out the exact dates of the auction. Hungry for more news? Read the full NameJet press release on our Media page.